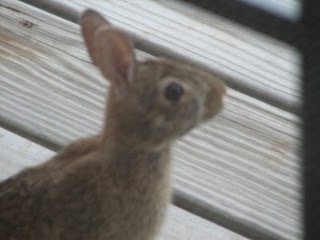 This Spring we have had rabbits living under our deck. We see them coming and going but they always hurry away when the see us. This afternoon my daughter noticed this out the window. The rabbit had come right up next to the house. It was looking right at us. I ran to get the camera but was only able to get this one picture before it hopped away. It was so cute. I love living in the country!